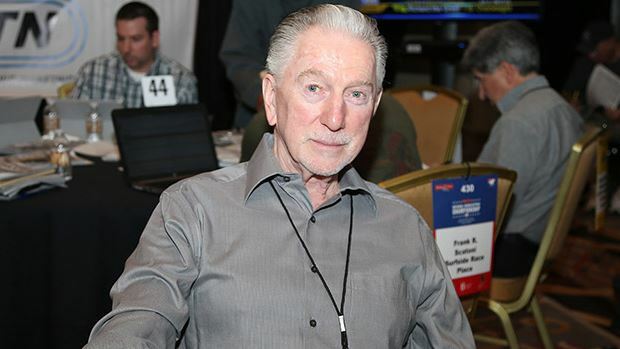 LAS VEGAS (Saturday, January 24, 2015) – The field for Sunday’s Final 50 is set as Day 2 at the Daily Racing Form/NTRA National Handicapping Championship (NHC) Presented by Racetrack Television Network, Sovereign Stable and Treasure Island Las Vegas concluded with John O’Neil of Huntington Station, N.Y., on top, holding a$253 bankroll. The highest score on Day 2 went to Lawrence Kahlden, who started the day with zero but rallied to sixth overall just on his Saturday total of $193.60 to earn a $5,000 bonus, as well as paid Breeders’ Cup Betting Challenge entry fees, live bankrolls, airfare and hotel worth in excess of $10,000. Jonathon Kinchen, a 31-year-old realtor from Austin, Texas, landed in the top 10 with both of his entries. He sits in third with $217.40 and eighth with $189. One of his entries was a late replacement for the late Ron Rippey, the 2006 NHC winner and inaugural inductee to the NHC Hall of Fame. Other Top 10 finishers were Ken Jordan ($249), Myles Richards ($208.40), Robert Pontani Jr. ($205.50),Lawrence Kahlden ($193.60), Joseph Muzio ($193.40), Dan Weisenburger ($178.60) and Joe Scanio ($176). The top 50 players now carry their bankrolls over to the Final 50 tournament Sunday morning and the resulting top 10 will play at the Final Table that afternoon to determine the ultimate placings, including the $800,000 grand prize and Eclipse Award as Horseplayer of the Year. Players outside the Final 50 will compete in a separate $65,000 Consolation Tournament on Sunday with reset mythical bankrolls. The full standings are available here. Among the Final 50 are three former NHC winners: Brian Troop ($162), Michael Beychok ($158.80) and John Conte ($156.60). Nobody has ever won the NHC twice. The top 50 finishers are guaranteed a $10,000 prize at the end of Sunday. The $2,215,000 prize pool for the Final 50 starts with $10,000 for 50th place and increases to the $800,000 grand prize for first place. The top four finishers will take home six figures, with $250,000 to second, $125,000 to third and $100,000 to fourth. To get to this point, the 606 NHC entrants (521 individual players) were required to place 30 mythical $2 Win and Place wagers – 15 on Friday and 15 on Saturday. The top 50 after Day 2 continue on to a Final 50 tournament Sunday and the top 10 will play at the Final Table to determine the ultimate rankings. Players outside the Final 50 will play in a separate $65,000 Consolation Tournament on Sunday with reset mythical bankrolls. The Final 50 Contest will be comprised of 10 optional races. The 10 that make it to the Final Table will all play the same seven mandatory races. Live coverage of the Final Table will be broadcast on HRTV, The Network for Horse Sports and live streamed on DRF.com. In its 16th year, the Daily Racing Form/NTRA National Handicapping Championship is the most important tournament of the year for horseplayers and is the culmination of a year-long series of NTRA-sanctioned local tournaments conducted by racetracks, casino race books, off-track betting facilities and horse racing and handicapping websites, each of which sends its top qualifiers to the national finals. Each year, the NHC winner joins other human and equine champions as an honoree at the Eclipse Awards. In addition to the founding title sponsor, the NHC is presented by Racetrack Television Network, Sovereign Stable and Treasure Island Las Vegas.